Shoot domesticated zombies in this lame iPhone app. Killing zombies is one of our favorite pastimes, but we don't splatter their brains just because. Slaughtering hordes of undead is often a means to an end, where taking out a gang of flesh eaters often reveals a hidden item or a new level. Cobra Mobile's Zombie Chav Hunt for iPhone, however, feels like a tech demo instead of a full video game. Although it lets us machine gun different types of monsters, there's no reward for our efforts. At first, we thought it was one of the iPhone's best apps. The game threw a bunch of zombies onto the playfield, and to kill them, we simply tapped the screen to zoom our sniper rifles and then hit the fire icon to blast holes their through heads. In a matter of minutes, we'd shot boy zombies, girl zombies, alcoholic zombies, zombie pigeons and even zombie rappers. We even unlocked additional weapons (shotgun, Uzi) along the way. Then it was all over in ten minutes. There's basically no point to playing Zombie Chav Hunt. Enemies never attack, the game lacks bosses and there are only three levels. You can attempt to beat previous scores, but you cannot upload them to an online leaderboard. You just go in there, cap a few zombies and bounce. It's the tamest horror game we've seen. That said, we're not sure what Cobra Mobile intended to do. If its goal was to create a simple to play shooter with lots of positive reinforcement, then mission accomplished. 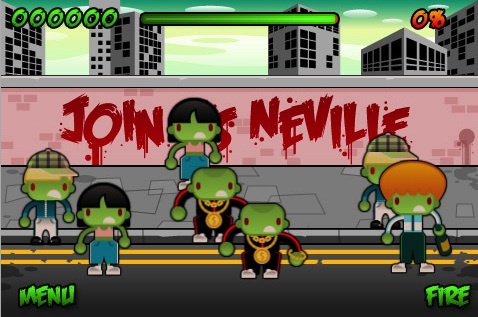 Zombie Chav Hunt is a stylish looking app that's fun in short bursts. We, however, prefer deeper and challenging games that force us to improve our skills instead of letting us win all of the time. Definitely a wasted opportunity and a great insult to our zombie brothers and sisters. What's Hot: Rapper zombies, three different weapons to choose from, stylish visuals. What's Not: Enemies never fight back, only three levels, no online leaderboard.